When it comes to luxury property for sale, there is an abundance of villa options available in countries across the globe. However, there are a few destinations that stand out due to the unique way in which their villas with pools and luxury facilities reflect and engage with the landscape around them. It stands to reason that architects and engineers would take the natural characteristics of an area into account before designing a villa to complement these features. Therefore, many villas end up being a complementary extension of their surroundings. The prestigious nature of a villa property is also dependant on the number of attractions and amenities available in its immediate vicinity. Investors will often choose a holiday villa because of the restaurants, spa facilities, golf estates and commercial shopping precincts available around it. The final, and one of the most important aspects, is the customising of a villa to fit the aesthetic tastes and visual preferences of its owner. There’s nothing more important than feeling at home in the villa you own. Contact us for more information on luxury villa options that complement your personality. Seychelles: This archipelago in the Indian Ocean is an incredibly popular island destination. Featuring the luxurious and prestigious Eden Island residential marina development, the Seychelles offers an exclusive range of island villa properties to the public. Each villa is accompanied by a private pool, state-of-the-art appliances and technology, as well as a private mooring and Electrically Powered Vehicle (EPV). Furthermore, each property can be customised in terms of interior design and furniture. Italy: When one thinks of Italian villas, immediately the region of Tuscany comes to mind. Because Italy is a central hub for many of Western Civilization’s art, culture and architectural movements, many of the villa options in Tuscany reflect an aesthetic passed down from ancient Greek and Roman influences. USA: It’s true that Americans tend to impress when it comes to technology and architecture. This is particularly true for villas in the USA. Including a diverse selection of huge landscapes there is a plethora of different villa styles to choose from, with many influenced by dessert, ocean, lake and even mountain features. The most popular villa destination in the USA is Florida and properties here can offer luxury and state-of-the-art technology. Thailand: Considereda jewel of the east, this country provides a lesson in contrasts. On one hand, Thai architecture and interior design is opulent and indulgent, with gold filigree and an array of luxurious materials such as silk and satin. On the flip side, the country also boasts an incredible landscape with luscious green fields and stunning beaches. Thailand villas offer both variety and luxury depending on where in the country you choose to invest. 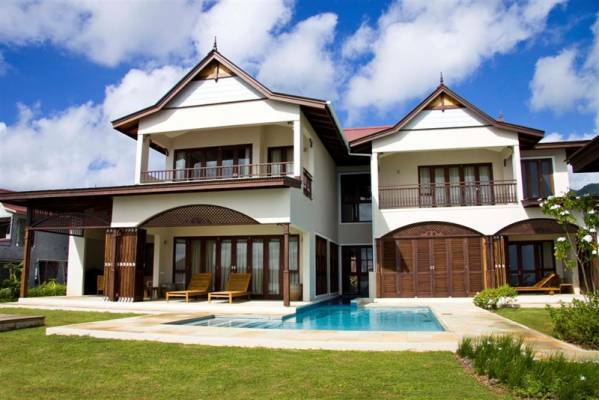 Contact Eden Island and buy a villa in one of the world’s most desirable island destinations.